Some are lucky enough to have a beautifully defined upper lip; but, for those less fortunate, it is an aesthetic ideal that many aspire to. 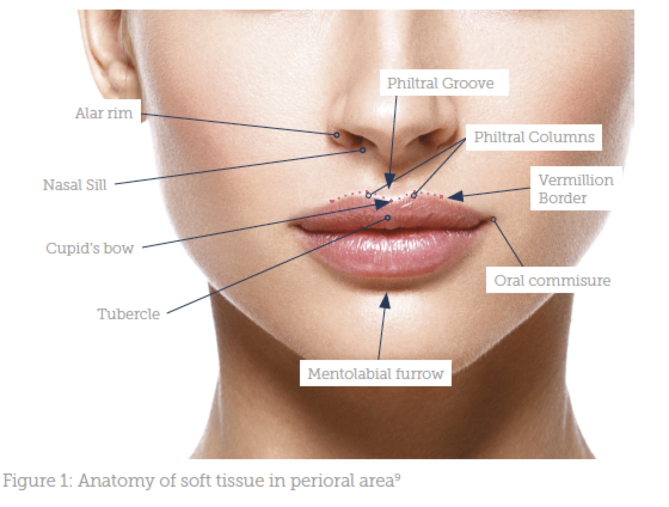 With a thorough consultation, excellent anatomy knowledge and careful injection technique of dermal filler, a more defined Cupid’s bow can be achieved. As with all medical aesthetic treatments, practitioners should perform a full clinical assessment, which includes taking a medical history and educating the patient of the treatment plan and product. A full explanation of possible complications should be given and consent achieved in the form of a signature. They should also highlight to the patient that facial attractiveness varies for individuals and emphasise that treatment is not a ‘one size fits all’ approach. 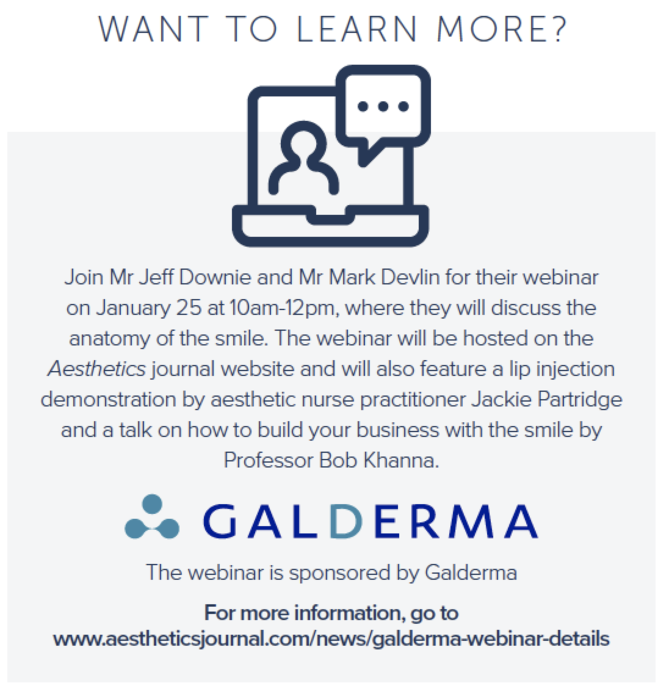 This is especially important for practitioners to recognise, as we are continuously seeing lip augmentation results on social media and in the press that do not complement the patient’s unique facial features and sit well outside the norm. In the consultation, give patients all the various treatment options, along with the benefits and downsides of these, which is likely to include surgery, dermal fillers, semi-permanent tattooing, as well as recommending no treatment. There are several circumstances where treatment is contraindicated; we would be wary if there has been a recent cold sore, and certainly wouldn’t treat if there was an active cold sore on the lip. A history of allergy to objective products may also be an area of caution, and a patient with unrealistic expectations or with a request to make an alteration to their appearance that made no sense would also be a big red flag. It’s important to identify the patient’s expectations and determine what is achievable before treatment. You also need to recognise and document any discrepancies to the entire lip and surrounding areas, such as inner or outer scars, trauma, lumps, bumps, mucous cysts or any asymmetries. Often patients don’t notice existing deformities, so it’s important to make patients aware of these and record them so they don’t later blame your treatment as the cause. Another thing to note when treating the Cupid’s bow is that we would usually never recommend treatment in isolation. Treatment usually involves the use of fillers in both the upper and lower lip, with an emphasis on definition in the top, so be sure to highlight this to the patient. This is unless there is a pre-existing abnormality, such as a unilateral cleft-lip and palette, a scar, a lack of volume due to trauma or obvious asymmetry. The major complication that can arise following filler placement, which most practitioners worry about, is either a vascular occlusion or an intravascular injection.7,8 If you understand the anatomy and where the vessels lie, then the risk of vascular events are significantly minimised. You are also more likely to get better results and a more satisfied patient. In the upper lip, the superior labial artery lies deep to the muscle, just below the mucosa on the inner aspect of the lip. There will normally be two branches of the columellar artery, which run almost parallel and lie in the middle of the lip. They run up to the nose and these vessels are also lying deep to the muscle (Figure 1 & 2).9 Many note the importance of lip ratios when assessing and treating the lip. For example, it is commonly quoted in the literature that to achieve the aesthetic ideal, the lip proportions should be one third top lip, two thirds bottom lip for Caucasians (1:2 or 40% upper and 60% lower lip volume) and equal ratios for those of ethnic descent (1:1 or 50% upper and 50% lower lip volume).10 However, today’s practitioners need to consider the fact that these ideals do change with trends. For example, the balance between the top and bottom lip in terms of the aesthetic ideal has been altered and more recent evidence suggests that the ideal has now become 1:1, with the upper lip having much more volume than previously recommended.11 Of course, as stated we believe it’s more appropriate to treat every individual lip in a bespoke way and assess how it appears on a unique face, rather than strive for these ratios exactly. A full understanding how the underlining hard tissue, skeletal support and dentition affects the appearance of the face will also impact treatment outcome.12 Always assess and understand these supportive structures in relation to lip support. Some patients, even relatively young patients, may have a denture, which can impact the appearance of the lip and therefore your treatment. Knowledge of gum and teeth health is also of importance; we recommend that practitioners seek training in examining the oral cavity. By using a good light and a trained eye, practitioners should inspect the lip by everting it to look inside. Then they can check the dental and gum health and look for concerns such as lumps, periodontal disease or dental caries. If disease is noticed, for example a dental abscess, you should avoid filler treatment and refer to a dental practitioner to address this issue first. When it comes to the Cupid’s bow, practitioners must determine whether you need to redefine a lip that once had a nice distinct bow or if you need to create one that never existed in the first place. As patients age, they lose volume in the lip, which may result in a reduction in the definition of the upper lip and a once well-shaped Cupid’s bow can become flattened.13 For these patients, treatment can be very straightforward and all that is needed is to restore volume for an immediate recreation of what was once there. You can create volume by injecting filler just within the vermillion of the lip below the skin vermillion border. If you stay superficial to muscle then that will rotate the Cupid’s bow upwards and you will get a nice natural rotation of the lip, which will improve the profile. Then you can just continue to volumise as needed to restore what previously existed. Be careful not to over-volumise. If you inject too much volume into the lip, the Cupid’s bow could become flattened, and this can cause a problem with definition. Many younger adults have this over-volumised, undefined upper lip shape and it looks unnatural and over-inflated. Similarly, if you overinflate the vermillion border it will result in a ski jump effect and produce the classic ‘duck lips’, which most want to avoid. For patients who have never had a defined Cupid’s bow, the approach is a bit trickier. This treatment can have varying results, and it may require several treatment sessions before you achieve the most ideal result. Our method would be to inject on the vermillion itself, below the mid portion of the lip. What you might want to create is a tubercle, a volumised effect in the central portion of the lip that lies underneath the philtral groove. If you create volume in here, and consider putting very small amounts of filler in the philtral ridges themselves, that should lift the Cupid’s bow up. Our recommended amounts are usually around 0.1-0.2ml to each area at one time. It’s important that you do this treatment in small incremental steps to build the Cupid’s bow and the philtral columns. We also advise that practitioners allow the patient to sit with a mirror in their hand and seek their input and feedback after injecting the tiny amounts of product, to determine if they are appreciating the changes. When treating the Cupid’s bow we prefer needles as we believe there is a greater degree of control and you can achieve more precise product placement. However, we always advise those new to aesthetics that using a cannula is safer to prevent damaging the blood supply. As mentioned, the blood supply is deep to the muscle, and if you use a cannula and stay superficial to the muscle, then it can be a safer treatment. If you are a confident, experienced practitioner then a needle can be a very precise way of treating lips, but practitioners may use both depending on what they want to achieve. For example, volumisation of the body of the lip with a cannula using a linear threading technique and definition of the Cupid’s bow with accurate small volume injections using the needle. If injecting superficially, we would recommend a product with a low G’ prime, so it blends into the vermillion border or philtral column. If you are injecting deep, then we recommend a product with a higher G’ prime, which will help to provide more volume. We prefer to use products from the Restylane portfolio (Restylane Kysse when treating lips), but many other hyaluronic acid products will give suitable results. As we use fillers that contain intrinsic Lidocaine, patients can tolerate lip injections very well without any anaesthetic, so our personal preference is to use either topical anaesthetic or nothing at all. Latest stats from the Aesthetics Complications Expert (ACE) Group indicate that 53% of the total number of filler-related complications that were reported between 2016-2018 were associated with lip augmentation.14 Although it is actually quite rare to get a serious complication in relation to blood supply of the face, it is not uncommon to get complications such as light bruising and swelling for example, and thorough knowledge of the anatomy will prevent more serious events. Ultimately, we find that the biggest complaint or concern from aesthetic treatments is the patients not being happy with the results. If you have agreed upon the treatment plan, have been transparent about the results you can achieve and you are careful about how you do it, that’s when you will achieve good, uncomplicated results that the patient should be pleased with. A defined Cupid’s bow is an aesthetic ideal for many patients. If the patient previously had definition which has reduced due to ageing, rejuvenating the area with volumising fillers can recreate what was once there. Although still achievable, a more complex procedure is to create a defined Cupid’s bow on a patient who never presented with one to begin with. Treat these patients with care and suggest injecting product over several sessions to build results over time. Etcoff N. Survival of the Prettiest: The Science of Beauty. New York: Doubleday; 1999. Stephanie Buck, Your upper lip has never been more important: The crucial cupid’s bow, Timeline, September 2016. GMC, Guidance for doctors who offer cosmetic interventions, April 2016. Funt D, Pavicic T, Dermal fillers in aesthetics: an overview of adverse events and treatment approaches, Clin Cosmet Investig Dermatol, 2013, 6:295–316. DeLorenzi C, Complications of injectable fillers, part 2: vascular complications, Aesthet Surg J, 2014 May 1;34(4):584-600. Cotofana S et al., Distribution Pattern or the Superior and Inferior Labial arteries, Plast Reconstr Surg. 2017. Popenko NA, Tripathi PB, et al., A Quantitative Approach to Determining the Ideal Female Lip Aesthetic and Its Effect on Facial Attractiveness, JAMA Facial Plast Surg, 2017 Jul 1;19(4):261-267. Paul I. Heidekrüger, Sabrina Juran, et al., ‘The Current Preferred Female Lip Ratio’, Journal of Cranio-Maxillofacial Surgery, 2017. Padmaja Sharma, Ankit Arora, and Ashima Valiathan, Age Changes of Jaws and Soft Tissue Profile, The Scientific World Journal, Volume 2014, article ID 301501. Uwe Wollina, Perioral rejuvenation: restoration of attractiveness in aging females by minimally invasive procedures. Clin Interv Aging. 2013; 8: 1149–1155. Aesthetics Complications Expert (ACE) Group stats 2016-2018. Data on file.